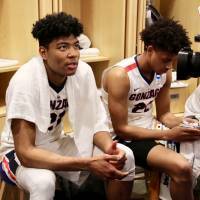 BOISE, IDAHO - It has been two seasons since Rui Hachimura took his talents to Spokane, Washington, and this year, the Gonzaga University forward began showing some of it. But even if he is on his way to making history, by possibly becoming the first-ever Japanese player to be taken in the first round of the NBA Draft, his peak is still far ahead of him. Hachimura, who averaged only 2.6 points and 4.6 minutes per game in his freshman campaign last year, has seen way more time on the floor in his sophomore season in 2017-18. The 20-year-old has scored 11.5 points and grabbed 4.6 rebounds playing 20.3 minutes per game through Gonzaga’s latest game, a 90-84 win over Ohio State University in the second round of the NCAA Tournament on Saturday at Taco Bell Arena in Boise, Idaho. The Bulldogs, the No. 4 seed in the tournament’s West Region, will take on No. 9 Florida State at Staples Center in Los Angeles on Thursday. 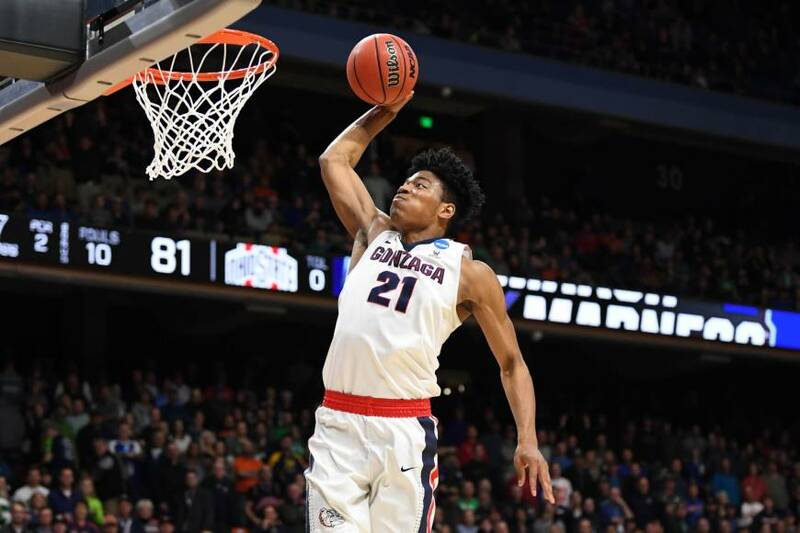 Hachimura had a chip on his shoulder going into the Ohio State game because he had played poorly, scoring just four points, during the first round in Gonzaga’s narrow 68-64 win over the University of North Carolina at Greensboro two days earlier. 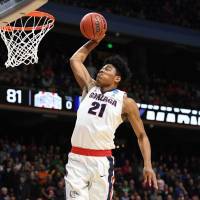 But he returned to the court strongly, finishing with a career-high 25 points and four blocks against the Buckeyes, helping Gonzaga advance to the Sweet 16 for the fourth consecutive year. But that did not necessarily mean the Toyama native gave his best performance. He had missed two important free throws in the final seconds in the first round, and could not recover on Saturday. He went only 6-for-12 from the charity stripe in the latter contest. To his credit, however, he sank five of his final six free-throw attempts, which all came with under two minutes left, in the Ohio State game. “They were big, big shots considering the points difference in that situation,” Hachimura said of those free throws. “That shows growth as a competitor, that shows growth with his belief,” said Few, a 12-time West Coast Conference coach of the year who took the Zags to their first Final Four and NCAA title game (where they lost to the University of North Carolina) last year. But Few, his other coaches and Hachimura himself do not think that the player has come anywhere near his top potential. To them, the versatile player has just gotten started. 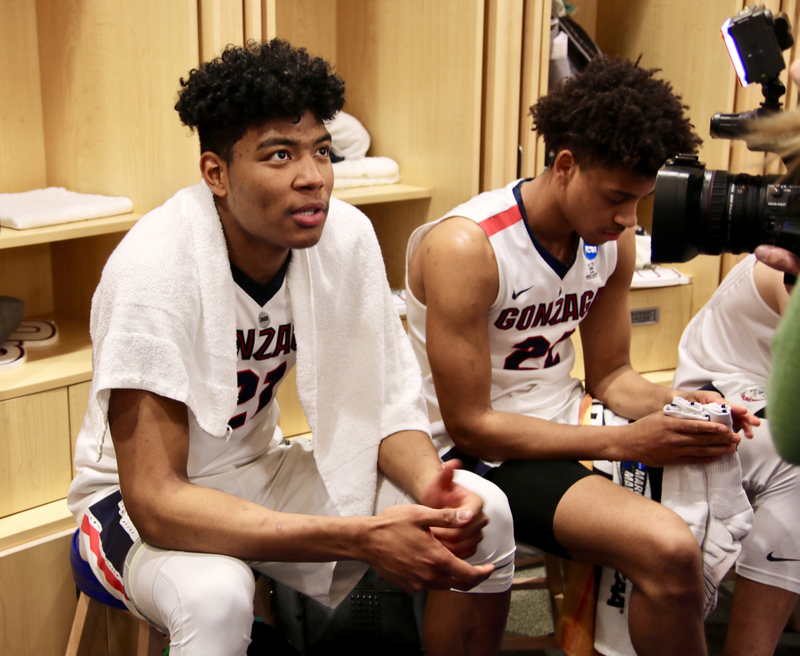 Tommy Lloyd, who has served as an assistant at Gonzaga under Few for the last 17 years, said Hachimura had a setback in the first-round game, but that is all part of the development process for him. And Lloyd also offered a warning to the Japanese media, who have come to the Gonzaga games to focus on Hachimura. “Rui understands the Japanese media (is) very concentrated on him,” Lloyd said. “And he doesn’t want to stand out for his teammates, because Rui’s a team guy. So he wants to kind of blend in with the team. Because of his progress as a player since last year, Hachimura has actually been more in the spotlight in the American media. He never takes a rude attitude toward reporters, but he admitted that he is not a big fan of dealing with the media so much. In terms of taking interviews from the American media, Hachimura said he is not as fluent in English as he is when he is speaking to the Japanese media in his native tongue. The Gonzaga staff have had to persuade him to be at the podium for official interview sessions. But at this point, it is still the Japanese media that consistently walks into the locker room to talk to Hachimura, regardless of how he performs on the court. “I hope that the Japanese media understands he’s young and they kind of let him, I would say, develop organically,” Lloyd said. “Not force him too fast. Let him develop at his own pace because Rui’s a great person, he has a great heart. And he’s a little bit shy. But I think there’s a beautiful innocence to that.